Way back in February, we told you about the brand new greener PlanToys material – PlanWood. PlanWood, a material announced at the 2012 American International Toy Fair, is an eco-friendly, non-toxic composite wood made using the 2 tons of sawdust produced by the PlanToys factory daily. We were super excited by the announcement and have been eagerly awaiting the arrival of PlanWood in our favorite toy shops. Sadly, it’s been a very long wait. Now, at long last it appears that the new PlanWood Play House is available at a few stores. This adorable three-story dollhouse comes with furniture plus two cute little dolls, perfect for imaginative play. There’s a nice two-sided play mat that acts as a wall or roof for the house or your child can use it for a play garden. No metal screw and nut are required for assembly. It’s discouraging that PlanWood is taking so long to get to the marketplace, but at least now you can pick up this adorable (and very affordable) PlanWood Play House. 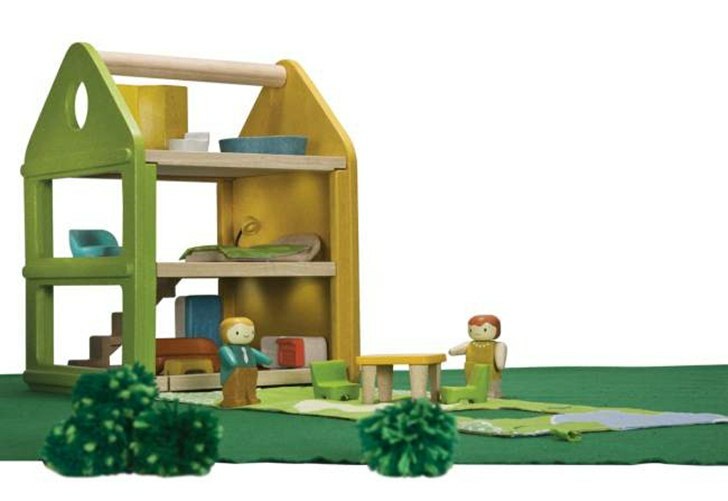 Way back in February, we told you about the brand new greener PlanToys material - PlanWood. PlanWood, a material announced at the 2012 American International Toy Fair, is an eco-friendly, non-toxic composite wood made using the 2 tons of sawdust produced by the PlanToys factory daily. We were super excited by the announcement and have been eagerly awaiting the arrival of PlanWood in our favorite toy shops. Sadly, it's been a very long wait. Now, at long last it appears that the new PlanWood Play House is available at a few stores. This adorable three-story dollhouse comes with furniture plus two cute little dolls, perfect for imaginative play. There's a nice two-sided play mat that acts as a wall or roof for the house or your child can use it for a play garden. No metal screw and nut are required for assembly. It's discouraging that PlanWood is taking so long to get to the marketplace, but at least now you can pick up this adorable (and very affordable) PlanWood Play House.